You might still looking for a simple and easy nutrition tip to be implemented in your daily activities. Good nutrition provides more than energy, structural components, vitamins and minerals. There are other substances in the foods that you just eat that became popular over the previous few years. In fact new invented foods such as protein bars have become a popular choice for a lot of people today. Believe it or not, most people still questioning on how they can manage their nutrition supplements including protein supplements for their daily meals and activities. You might still finding your ways and steps on how you can manage your meals the right way. 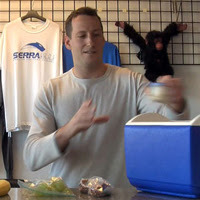 I found an amazing video on nutrition tip by Billy Hofacker, a head instructor for the Serra BJJ Academy and personal trainer. You will love the way Billy explains his idea of Planning your meal, Preparing your meal and Packing your meal. This is a genius way of arranging our protein supplements in our daily life. The best thing is you can start using the nutrition tip right away and I guess the best thing that you can do is watching his video, digest the understanding and start implementing the idea!